Although the turbulence generation shown (figuratively) above is by a shear (or dynamic) instability, i.e. a Kelvin-Helmholtz billow pattern, it could equally well be generated by a convective (or static) instability. Turbulent mixing across a region characterised by a vertical gradient of (generalised potential) refractive index gives rise to refractive index irregularities across a wide range of scale sizes with a one dimensional k-5/3 dependence within the inertial subrange. Radar signals are backscattered from all scale sizes of irregularities but only those irregularities close to half the radar wavelength (3.2 m in the case of the 46.5 MHz NERC MST Radar) give rise to constructively interefering returns, hence the term Bragg scatter also given to this mechanism for radar returns. Since the half radar wavelength is within the inertial subrange of turbulence at tropospheric and lower stratospheric altitudes, the refractive index irregularities are expected to be isotropic. The (one dimensional) statistical nature of the refractive index irregularities will therefore be invariant of the angle at which the turbulent layer is observed and so the radar returns are non aspect sensitive. The width of turbulent layers generated by shear instabilities ranges from a few 10's of metres to several hundreds of metres. 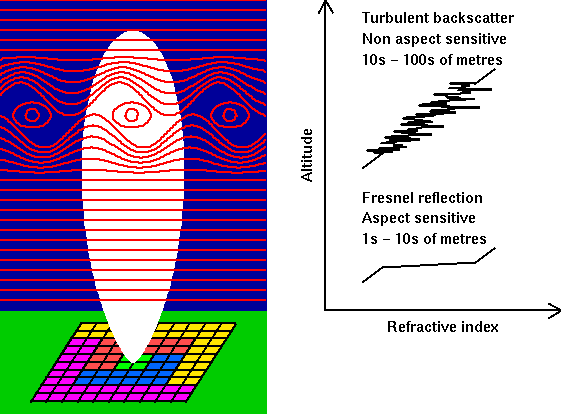 Aspect sensitive radar returns are thought to result from partial reflections from sharp vertical changes in refractive index which are horizontally coherent over a spatial scale of at least the first Fresnel zone of the radar. The strongest radar returns occur for radar beams directed orthogonally to the reflecting layers and decrease as the angle between the radar beam and the perpendicular to the layer increases. Clearly the presence of such features is inconsistent with turbulent mixing which would erode the horizontal coherency. Studies using high-resolution balloon-borne probes have detected the presence of `temperature sheets' which are consistent with the refractive index structures required for partial reflection to take place; sharp increases of temperature (and hence refractive index) over vertical distances of the order of a few metres to a few 10's of metres. Although the scattering/reflecting layers are nominally horizontal (i.e. parallel to the isentropes) it appears that they can be tilted by up to a few degrees by the effects of gravity waves.